How fast is fast enough? About 100 steps per minute might be a reasonable goal, but your mileage may vary. 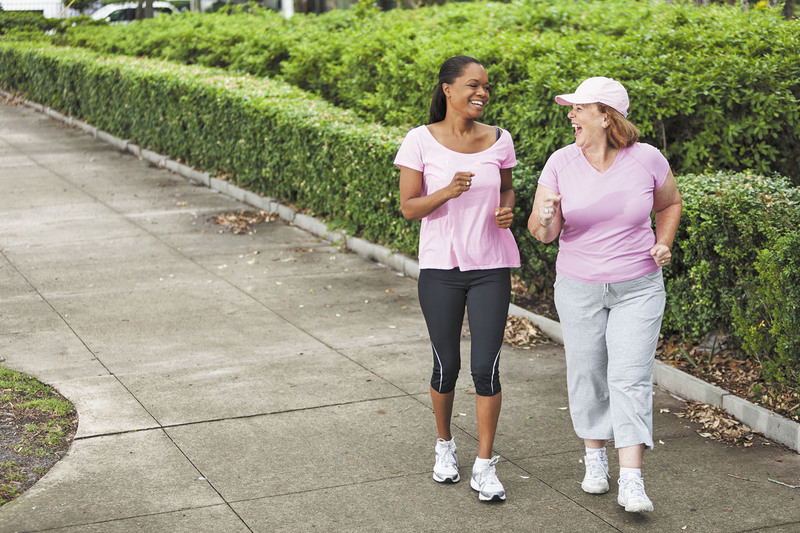 Walking can be a wonderful way to get exercise. But do you ever wonder if you're moving briskly enough to benefit your heart? There's a quite a difference between a leisurely neighborhood stroll and a purposeful gait when you're late for the bus. Now, new research suggests that a pace of about 100 steps per minute qualifies as brisk walking for many people (see "Take this in stride: A study of walking speed"). Using that cadence as a benchmark might make sense for some — but not all — people, says Dr. Beth Frates, who directs wellness programming for the Stroke Research and Recovery Institute at Harvard-affiliated Spaulding Rehabilitation Hospital. "For example, 100 steps per minute could be a good goal for a middle-aged, relatively healthy person who's walking on a mild day when the conditions allow for safe footing." In fact, that pace might even seem a bit slow for a fit person who exercises regularly, she says. In contrast, 100 steps per minute might be too fast for people who are out of shape, either because they don't have a regular fitness routine or have been sidelined by injury or illness. That's why she and other physicians often recommend that people use the "rate of perceived exertion" scale, also known as the modified Borg scale (see "Walking while talking"), to estimate how hard they're exercising. To estimate the number of steps per minute (pace) that correlates with brisk or moderate walking, a team of researchers reviewed findings from 38 recent, high-quality studies. All of the studies tracked people's walking pace, as well as other measures of effort, such as increases in heart and breathing rates. The studies included people ages 18 and older, although the average age in most of the studies was under 40. Even though the participants had a range of different body weights and fitness levels, researchers found that what constituted brisk or moderate walking was consistent across the studies: about 100 steps per minute (or about 2.7 miles per hour). However, these results don't necessarily apply to older adults, who may reach moderate-intensity exercise levels at a cadence lower than 100 steps per minute, the authors point out. Other factors such as height (which affects the length of your stride) and health status could also influence an individual's step count. The study was published in the June British Journal of Sports Medicine. "To use the Borg scale, you have to pay attention to how hard you're breathing, which is a clear indicator of how hard your heart and body are working," Dr. Frates says. Aim for an exertion level around 5 or 6 — about halfway between sitting still and exercising as hard as you possibly can. Measuring your heart rate is another way to assess how hard you're exercising, but this method has a few drawbacks. For example, it's not always easy to find and count your pulse with your fingers. Also, the heart rate monitors on fitness trackers and smartwatches aren't always accurate. And if you're taking a beta blocker such as metoprolol (Lopressor, Toprol) or atenolol (Tenormin) to lower your blood pressure, the drug will also lower your heart rate. That means your heart rate will not be a good indicator of how hard you're exercising, Dr. Frates explains. But even with a beta blocker, you'll breathe harder and your muscles will become tired, so you still can use the Borg scale. Known as the modified Borg or "rate of perceived exertion" scale, this measure can help you gauge whether you are exercising intensely enough. Another good option is to just track the time you spend walking. If you're just getting started, begin with 10 minutes a day and gradually add a few more minutes every week. If you have a walking routine, try counting how many steps you take in 10 seconds and multiply by six to find your steps per minute. If the number is not close to 100, don't worry — listen to your body and use the perceived exertion measure instead.